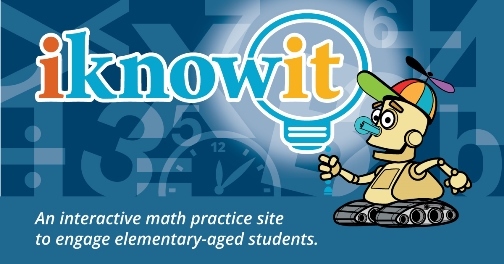 Recently we were given the opportunity to review a new subscription-based math website called I Know It. It is an interactive math practice website designed to cover most common Kindergarten through 5th grade concepts. We received a one year family membership, which is good for up to four students. 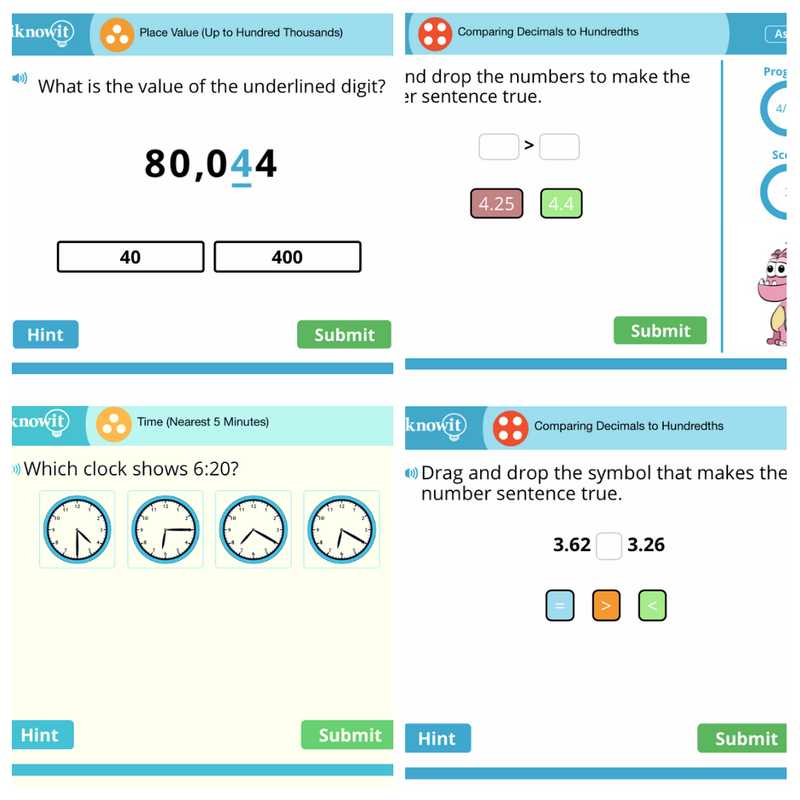 I Know It was developed by Super Teacher Worksheets, which we have used and enjoyed in the past, I was interested in trying out their newest offering. To begin, I set up sub-accounts for the kids, where I listed their grade level, and the level at which they are working. This is also where we can choose a profile icon. Everyone shares one login, but chooses their icon for logging into their individual accounts. Within their account, they can first see their assignments, then the available topics. I have primarily used this with my older two kids, who are 9 and 11 years old. The first thing you should know is that this is a practice website, and does not teach the concepts. However, it covers a wide variety of K-5 topics, and can be used as a quality supplementary resource for any curriculum. There are two ways students can use this program. First, they can login and immediately see any assignments I have posted for them. I usually tell my kids which ones to complete. For Emory, I have him occasionally review math facts to build speed, or do practice corresponding to his math curriculum. For assignments, you can pull from any grade level. 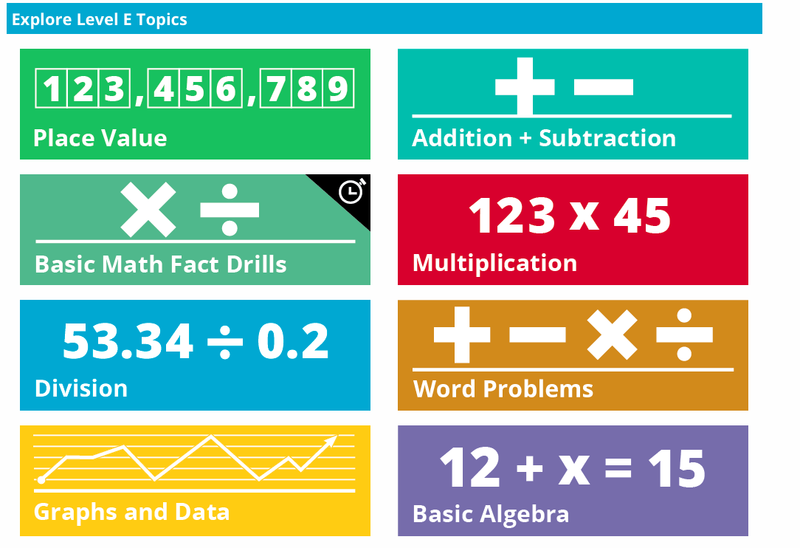 The other way to use this is to allow the student to explore any topic that is available. As you can see, this is from Level E, which corresponds to 5th grade. It shows as letters instead of grade levels, which I suppose is good for an older student working below level. Even though Elliott is in 6th grade, I added him as a user for the purpose of this review. There is enough overlap in 5th and 6th grade topics, especially at the beginning of the year when curriculum is reviewing, that he can do this program as well. When correct, the character in the corner does a little dance or otherwise gets excited for you, and you get a green checkmark and affirmation like "You rock" or "peachy keen" or "genius!" If the answer is incorrect, you're shown how to work out the problem. 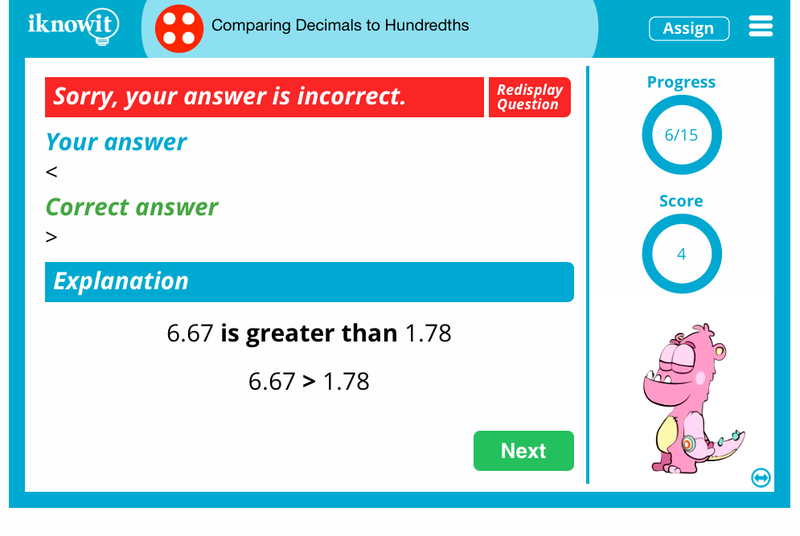 I really like this feature, because I know some full curriculum programs that don't walk you through incorrect answers! Assigning a lesson is fairly easy. 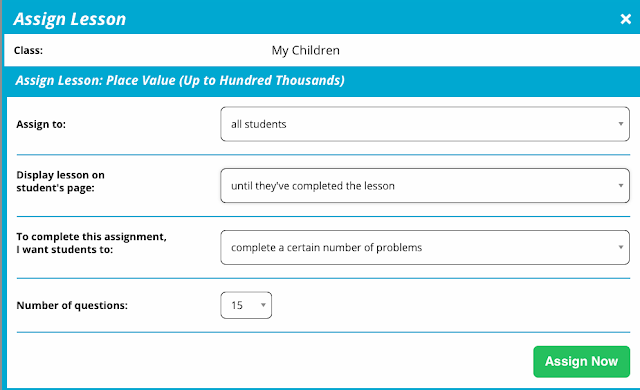 I just click the assign button, and I can choose to assign to all students (which would work well for a classroom environment) or some of my students. 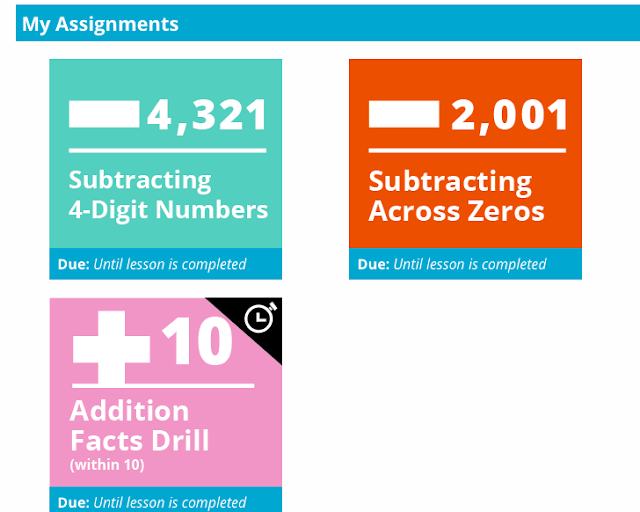 I can choose to assign until they complete the entire lesson, or I can set it to expire after a certain date range. I can also decide if they must complete the assignment by answering a specific number of questions, or if they must work for a certain amount of time. I usually set it for time, because I want to make sure we do short lessons. Within the parent account, I can also look at my assignment log, or look at the individual child's progress. Looking at their progress, I can see which topics they've completed, their percentage score, and I can click through to look at the assignments and how much time they spent or the actual questions and how they answered. For a practice website, this is very thorough! It works as a supplement to your primary curriculum to review or for extra practice if necessary, or it might work well for summer practice as well. You can sign up for a 60 day trial, which is a great opportunity to see if this is something that will be a good fit for your family. Subscribe by email! You receive each article posted, but your email is not used for anything else! Some links on this blog are affiliate links. This means that if you happen to purchase through one of those links, you will not incur any additional costs, but I might receive a small commission. Please read my disclosure for further information, and thank you! Mom's Heart © 2011-2018. Simple theme. Powered by Blogger.